Taiyo & Ciscomoon Let's RE:START!! The legendary dance and vocal unit that shone brightly from the end of the 20th century through the beginning of the 21st century will be giving their first and last Live Talk at the "Palace of Subculture"! "I thought if we missed this 10 year anniversary, we'd never get back together"
--Were you all aware of Loft Plus One before? Shinoda: This is the second time I've been here. I came for Yamamoto Shu-san's Live Talk before. Inaba: Yamamoto-san was a big help to us back in the Ciscomoon days. Kominato: I'm an internet wota (laughs) I know all about Plus One. Today was my first time coming here, but it has a nice atmosphere. I love the disorganised look. Probably because I'm into the Subculture Community on mixi (laughs). Shinoda: I have no idea (laughs). Inaba: There are times when we have no idea what Komi is talking about (laughs). Is "subculture" some internet lingo? Kominato: It's not net lingo (laughs). Inaba: I see (laughs). I'd heard the name "Plus One" before, but this is my first time coming here. It's a strange world, but it seems interesting. --But still, I guess you never even dreamed that you'd be performing here. Inaba: No, no. It feels more like... I never thought we'd be asked here. --This resumed activity of Taiyo & Ciscomoon, it all started with the release of "Mega Best" late last year, right? Kominato: No, that's not true. We were already thinking we should get back together for the 10th anniversary of our debut, but the "Mega Best" thing came later. I was the one suggesting to the others that it would be good to do something for our 10th anniversary, since I'm the one with all the free time (laughs). Acchan is the only one with Up-Front Agency these days, so we had to ask, "Is it possible the way things are now?" That's when we heard about "Mega Best". It was completely after-the-fact information (laughs). Inaba: So the three of us consulted with the higher ups. We found out the timing was perfect with the "Mega Best" coming out, so we talked about, "How about putting up a blog to see how things go?" --So you still stayed in touch after disbanding? Inaba: We didn't all just go our separate ways, but it wasn't like we saw each other all the time either. We all had our own circumstances after all. Shinoda: After disbanding, we all settled into our own lives, and we gradually had less chances to see each other. It was like, "I wonder how the others are doing now..."
Kominato: When I did call, we talked like we'd just seen each other yesterday. But those phone calls were sometimes about a year apart. Shinoda: It was a long time, wasn't it? Kominato: It was, it was. Now that we see each other all the time again, it's a strange feeling. --(laughs) But now we can see on your blog that you're going to Chinatown, going strawberry picking, and generally getting along well together. Kominato: It's not like we weren't friends back then, but times like that happen. It feels like there wasn't any time to spare. So in a way, maybe now I have the time as an adult. --Were you always thinking your wanted Taiyo & Ciscomoon to do another concert someday? Kominato: People were always saying, "Please do a concert." The fans who came to my own concerts were always saying they'd like to see another Taiyo & Ciscomoon concert someday, even though they knew it couldn't happen. Myself, I'd been thinking for the past few years about what would be the best timing, and I thought if we missed this 10 year anniversary, we'd never get back together. So the year before, on the ninth anniversary, I started getting in touch with everyone. It's been eight and a half years since we disbanded, and ten years since our debut, so I thought we'd have to start moving somewhere in that period if we were going to do anything. But there was also the question of if Up-Front would let Acchan take part (laughs). I was fine, and Miho-chan could do something, so I thought that was all right (laughs). In my mind, Acchan's 15 year anniversary event for OPD (Osaka Performance Doll) was a big deal. If she could do that, I was sure they'd let her take part in something with us too. "She's doing well. She's working hard for herself in Shanghai"
--So with all that out of the way, on January 9 this year, your held an in-store event at HMV Shibuya, and you stood in front of your fans for the first time in eight years. Kominato: Miho-chan was so into it, she even wore a wig [a blonde afro similar to what she had around her debut] to the event (laughs). --And you got a phone call from RuRu-san in Shanghai, and it must have been a pleasant surprise to hear her cheerful voice. Kominato: It would have been even better if she could have been there with us. We thought that, and I'm sure she did too, but RuRu has her own life now. That long distance phone call was the best we could do without causing problems for her. Shinoda: I'm sure the fans wanted to see her, but we couldn't see her either. In the eight and a half years since we disbanded, we haven't seen her at all. Inaba: Huh? We saw her once. We all went out to dinner with her. Kominato: I don't remember that (laughs). Was that just after we disbanded? Inaba: It was when RuRu came back to Japan once, and we went out to dinner in Shibuya with her family. Shinoda: Really? I'm starting to lose my memory these days (laughs). Inaba: But on the other hand, you can remember some amazing details too (laughs). --That's terrible (laughs). Was it Kominato-san who got back in touch with RuRu-san? Kominato: Yeah, it was me, the one with all the free time (laughs). For ages I've been unable to imagine life without the internet, and when I'm at home, there's always a laptop on my knee (laughs). I'm sure that someday RuRu will be able to tell us all in person what she's been up to. But I'm not sure when that'll happen. She'd been busy working in show business all this time, so she didn't have much free time for herself for ages. It seems like she's gone to Shanghai to be able to start doing more things for herself now. That's why even though she may be connected to this upcoming show, I know we can't interrupt the things she's just starting. It may be strange for me to be putting words into her mouth like this, but it's most important that her heart is what reaches us at the show. That's why I want to just watch after her warmly. But she's doing well. She's working hard for herself in Shanghai, and trying to work hard so that she'll have more flexibitly if she comes to Japan. I can completely understand not wanting to break that style. --I see. On January 19, you were guests at Melon Kinenbi's own "Melon Greeting vol. 8" at O-east. After getting their "passionate love call", you had to hurry to make it happen, right? Inaba: Melon Kinenbi have always loved us, and I'm a really close friend of their leader Saito Hitomi. By all rights, there's no way that an inactive group like ours would be called to their event. But it seems like after seeing our HMV in-store event, they got a strange feeling of, "Maybe we can call on them?" --You sang "Tsuki to Taiyou" and "Magic of Love", but we honestly wanted to hear more from you. Shinoda: So we really put our all into just those two songs (laughs). Inaba: Please try to remember, we're a group that had more than eight years of nothing (laughs). Kominato: And since RuRu wasn't there, somebody had to take all her parts. Shinoda: We'd forgotten it all (laughs). Kominato: The formations were different, so we had to try to remember the choreography... But I think we did pretty well for ourselves. "The other members of Hello Project are inheriting that singing"
--The dances from back then, could your bodies still remember them? Shinoda: There was a sense of that, yeah. It was like we just needed to double check, then we'd work the rest out. Inaba: It's just like riding a bike. Once you learn, you never forget. It's just, we couldn't move in the same way we did eight and a half years ago. We've all grown a little older. --But especially for you Inaba-san, it seems you've been taking dance lessons in the home of dance, New York. Inaba: No, no. It wasn't such a big deal (laughs). But even with that eight and a half year gap, the three of us were in synch. Even now, we can remember those sensations. Kominato: But somehow, the fans said, "You can still dance!" I don't think I'd been really dancing properly, but I had to do something for a Taiyo & Ciscomoon performance. Because I'm a member of the group too (laughs). But still, it took me a while before I could get the hang of the dance. I kept remembering parts of it wrong. Inaba: That's right. You can see the difference from 10 years ago (laughs). Kominato: During the lessons, I had to put my own particular interpretations into it (laughs). --On the subject of "Melon Greeting", Saito-san was so overcome with emotion on that day (laughs). But I could really understand how she felt, and just watching I could feel it hit my heart. Kominato: Well I did think, "Is she taking it that far!?" (laughs), but I was really happy that it affected her that much. I could understand the feeling, and was happy that they honestly seemed to think that it was a big deal for us to be there with them. Inaba: Absolutely. Melon even sing Ciscomoon songs at their concerts. --Two years ago during their "Lock On!" tour, they sang a cover of "Hey! Manatsu no Shinkirou". Kominato: It's not just Melon. Even today, there are lots of Hello Project members who say they love us and talk about "the legendary Taiyo & Ciscomoon". --Country Musume with Konno and Fujimoto (Morning Musume) covered "Magic of Love" and "Don't Stop Renaichuu", ZYX covered "Gatamekira", and when Matsuura Aya-san did a cover of "Uchuu de La Ta Ta", Inaba-san herself took part in it. Inaba: With Matsuura, yeah. And when C-ute covered "ENDLESS LOVE ~I Love You More~" and "Yes! 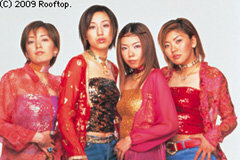 Shiawase", I think a lot of new fans thought they were C-ute originals. --Listening to "Mega Best", I can clearly hear the amazing high quality of Taiyo & Ciscomoon and T&C Bomber's songs. So it's as though the other members of Hello Project are inheriting that singing. Kominato: The songs were all so cool. At the time we couldn't praise ourselves like that, but listening now they don't sound old-fashioned at all, and I think most of them are songs that you could still hear normally today. "It's so embarrassing, I can't watch"
--By the way, have you all listened to "Mega Best"? Shinoda: I listened to it once. Kominato: Once? (laughs) I have the originals on my iPod, and I still listen to them today. Shinoda: I do the same. I listen to the originals on my iPod instead of the "Mega Best" versions. Kominato: I like the songs that weren't on the best of album. I have one folder with just the b-sides to the singles, and that gives it a fresh sound. I also have folders like, "the songs that we never sung live" (laughs). That's got songs like "Kawaii Hito" or "Chinmoku" in it. Kominato: If a song makes me wonder, "When did we sing this?" or "What was this the b-side to?" then it's like I'm listening to somebody else's music. The songs we sung in concerts are like the songs I raised myself. So when I hear songs I didn't raise, I think of it like, "I'll be able to sing songs like this if I keep going." --There's a DVD that comes with "Mega Best" which has videos and rare live recordings on it. Is it embarrassing to watch? Kominato: It's so embarrassing, I can't watch (laughs). Shinoda: Huh? You haven't watched it!? Inaba: I'm too scared to watch it too (laughs). I haven't looked at it yet. But I did listen to the CD. Shinoda: Yeah, that DVD really is scary. Maybe it's better not to watch (laughs). Kominato: Even though I haven't watched it, it's appeared in my dreams (laughs). Shinoda: You can tell just by glancing at our final concert before we disbanded. We can tell ourselves by looking at our costumes, but I think just about anybody can see it. Between images of us wearing those blue costumes that should never be seen, and seeing images of that final concert, you can clearly see the difference (laughs). Inaba: "Should never be seen"? (laughs) You mean how we grew? Shinoda: I know, I know. We all grew so much. Kominato: Even though I haven't watched the "Mega Best" DVD, I've seen videos on YouTube and Nico, and it makes me realise that even I love Taiyo & Ciscomoon too. Inaba: In my case, I'm still singing Ciscomoon songs at Hello concerts. When I do those, I first take out old videos and watch them to check the choreography. When I watch those "dance videos", it really makes me think what a terrible dancer I was in the beginning (laughs). The only way to describe it is, "What the hell is this!?" But I can see that I started to get a lot better from about "Magic of Love". Kominato: The videos are shot to show off the choreography, so when I watch them, they're so bad I find myself thinking, "Do it properly!" (laughs) But I also have to say that watching them now makes me think, "That was really fun," or "I want to do that again." Even though I couldn't dance well at all (laughs). Kominato: It's just like watching an old video of an artist you liked and thinking, "Oh, I used to like them..." So I think the fans will be all right, but it's just no good for us (laughs). --But at this Live Talk, we're hoping to see a lot of treasured images from the past. Inaba: That's right. I'd like to do something here that we can't do anywhere else. "The members and the fans coming together"
--Reading the entries and comments on your blog, I can really get a strong feeling of the members and the fans coming together to make a Taiyo & Ciscomoon comeback a reality. Inaba: Everybody is so kind. It makes me honestly so happy and thankful. --When Kominato-san suddenly told the fans she wasn't certain about the future of the blog, there were about 177 comments posted in the blink of an eye. Kominato: I was just trolling (laughs). But of course, I didn't mean it with any ill intent, you know? I just threw it out there to make sure that everyone would want to make a Taiyo & Ciscomoon concert a reality. Inaba: From our standpoint, we definitely want a concert, but we couldn't make it happen if nobody would come and see us or support us. --Even after eight and a half years, there are still so many passionate fans posting, so that must be really reassuring. Inaba: It really is true. I'm also surprised by how many people found out about us and started listening to our music after we disbanded. Kominato: With all the people who have supported us from the beginning, and all the people who came to like us somehow after we disbanded, reading the blog comments is a strange experience. --Right now there's a form on the blog asking for people's hopes for the concert, right? Kominato: Even if we're looking for a venue right now, we don't know what kind of capacity we'd need. So we're trying to get an estimate for that, and we want to hear what people want to see. Reading those messages, I can really feel their passionate feelings. Even those who don't post comments on the blog are writing their feelings in that message form. They say they want to see a nationwide tour, or they want the four of us to perform in Shanghai where RuRu lives (laughs). Shinoda: I think it might be a bit too soon for us to be going to Shanghai (laughs). Kominato: But all the fans could enjoy some good Chinese food while they're there (laughs). Kominato: That's right. Since we're here, we should come up with an original menu just for the one day. --The tickets for the event have sold out, so there are a lot of fans who couldn't buy any, which is unfortunate. Inaba: We really are thankful for that. And at the same time, really surprised. --At the in-store event at HMV, you only had 30 minutes to talk, and it went by in a flash. Hopefully you can give a much deeper talk this time. Kominato: Of course. We haven't decided what to talk about, but we'll be talking freely, and I think it'll be pretty interesting. We'll be getting away from the usual topics, since at HMV we had to limit what we said due to time and other constraints (laughs). But this time there's no holding back, so it's going to be fun. --At HMV, it really left an impression when Shinoda-san started going on and on (laughs). Kominato: That's right. I was thinking, "Don't keep talking..." too (laughs). Shinoda: Huh, really!? I was really trying to think about everything I said (laughs). Normally I say whatever's on my mind, so at the event I was trying to think about the time limits as I was talking. "It'll deepen your bonds with your fans"
--On stage you'll be able to eat and drink along with the fans, so hopefully you'll drink a lot. But looking at your blog, when the three of you go out for a meal, it seems like Kominato-san is the only one who drinks. Am I right? Kominato: Actually, Acchan drinks too. Inaba: I only drink a little. Shinopi is the only one who can't drink at all. Shinoda: If I want to get drunk, I can drink. But I've never thought that alcohol tastes good (laughs). If I've just lost a game or something, and it's time to say, "Okay, I'll go out tonight," then I can probably handle about three drinks. Inaba: Well, whether she's drunk or not, Shinopi will still run her mouth off (laughs). Kominato: Miho-chan is someone I'm normally with when I drink anyway, so that's a big relief for me (laughs). Acchan just needs to drink a little and she gets really cute, so I really hope people get to see that on the day (laughs). Shinoda: But drinking in front of a crowd? Inaba: That's right, we've never done it in a place like this. Even if I haven't had much to drink, I'm the kind who'd say, "That's enough," and want to quit. So that's a bit of a worry (laughs). Kominato: I think that when Acchan's drunk, she gets men excited. But I just start acting more and more like an old man (laughs). Shinoda: Yeah, I can't deny that (laughs). Kominato: When I think of the happiness that first beer brings, I can't help it. In the evening, I start feeling withdrawl symptoms. Kominato: When I'm cooking, I'll crack open a can of beer, and it tastes so good. Especially that first mouthful. Shinoda: You're just a kitchen drunk (laughs). Do you use the rest of it in your cooking? Kominato: I don't. I drink it all up so there isn't any left over (laughs). --(laughs) Anyway, hopefully you'll be able to make a concert a reality. We still haven't seen Shinoda-san's cartwheels and backflips yet (laughs). Shinoda: If there isn't enough room for an approach run, I can't do it. On a smaller stage, I'd still be in my approach when I run off into the wings (laughs). Kominato: That's why we need to find a venue where you can do that. Inaba: That's right. And if the ceiling is too low, you might hit your feet (laughs). --This Live Talk can sort of be seen as a group rally for making a concert actually happen, so hopefully it'll deepen your bonds with your fans. Shinoda: That's my biggest fear (laughs). Kominato: In my case, a lot of people have been writing online, "Was Kominato-san really that kind of person?" I'm thinking, "What kind of person?" (laughs) It seems like a lot of people had the idea that I was a clean and modest kind of person, but that's not true at all. I think the other members, the staff, and the fans from back then all knew that when you take the lid off of me, I'm an old man at heart (laughs). --That's just the kind of talent we want to see at Loft Plus One (laughs). Kominato: I'm a little afraid that I'm going to get carried away in this atmosphere and show Taiyo & Ciscomoon in a completely different light (laughs). Shinoda: With Komi, it seems like it could turn out to be a solo Live Talk (laughs). "There's still a lot that we can talk about"
Kominato: At my solo concerts, we always drink a toast, but that's after I've finished singing. This time I'll be drinking from the beginning, right? Thinking about that makes me wktk, wktk (laughs). Kominato: "Waku waku, teka teka". It means your heart is dancing with excitement, and your face is flushed. Inaba: I don't know what you're talking about (laughs). Also, there's that "or-something" one, right? What is it? Kominato: You mean "orz". That's the shape of a person who's collapsed to his knees. Shinoda: Hm... Is that common knowledge? Kominato: It's well known on the internet. --It seems like Inaba-san and Shinoda-san don't know much about the internet (laughs). --Thinking about it, compared to now, the internet wasn't so widely used back when you were active. Kominato: True. The medium changed from video to DVD, and there have been a lot of other changes in the last 10 years. Shinoda: When we came back to Japan after the auditions in San Francisco, I think I was the only one with an MD player, right? That's how long ago it was. Kominato: That's right. So Tsunku?-san bought MD players for the other members... No, wait. I had an MD player too, so he bought me a stereo (laughs). Shinoda: In those days, the original recordings for our new songs were given to us on cassette tapes. Somewhere along the way, that switched to CDs. Inaba: Yeah. And all of our singles were released in those long rectangular cases. "Magic of Love" had a square jacket, but after that with "Marui Taiyou ~Winter Version~" we went back to the long cases for some reason (laughs). Shinoda: We were going against the trend (laughs). Inaba: Thinking about it like that, it really does seem like a different era. --Finally, please give a message to all your fans who are all wktk about the Live Talk. Inaba: I think things are going to be this messed up at the Live Talk (laughs). Shinoda: Sorry, sorry (laughs). It is about the Live Talk. But I want to see images of your pasts that I don't know about. Like Acchan's time in OPD, or Komi's minyo singing. Inaba: Oh, images of our upbringings. Shinoda: Don't you want to see things like that? ...So let's ask everybody reading this (laughs). Kominato: I see. There are some videos of OPD and Miho-chan at the Seoul Olympics on YouTube. But there's nothing of me singing minyo before I was in Taiyo & Ciscomoon (laughs). Shinoda: I think a lot of people don't really know much about our pasts. About three years ago, when Kuroda Mayu won the women's all-around finals at the national inter-highschool championships, there was an article on the computer saying, "It was the first consecutive set of wins since Shinoda Miho's 1989 victories 17 years ago." --Was that on a major message board? Shinoda: ...Maybe? (laughs) Someone there said, "I had no idea Shinoda-san was that serious a gymnast." But he did know I was a famous athlete (laughs). Inaba: That's terrible. You were an Olympic athlete (laughs). Kominato: But I think it's good that there still isn't a lot of information around the net about Taiyo & Ciscomoon. That means there's still a lot that we can talk about. We'll be revealing a lot of episodes for the first time at the Live Talk, so I hope everyone is looking forward to that.